← Happy St Patty’s Day! …the only thing you need that maybe not everyone has at the moment, is a loom capable of knitting in a fine gauge. The one I used on the booties above is from Decor Accents and can be found here. But any fine gauge loom will do. Also, I’ve gotten a lot of requests about whether or not it’s okay to use an Extra Fine Gauge loom for these little cuties…the answer is…Of Course! 🙂 You just need to do a little swatch and adjust the pattern as necessary…these knitted up at 11 stitches for every 2 inches using #4 Cotton Ease by Lion Brand yarn. And Everyone…Thanks a Bunch for your wonderful comments, and willingness to loom along with me…Stay tuned for more details as I work out all the kinks in the process…and don’t forget to comment here so I can keep a good count…Thanks!!! PPS: EDIT 10/01/09: I’ve gotten so many responses to this particular post about the booties from folks that haven’t had a chance to read the other posts about the creation of these little babies…particularly about the pattern being available for sale in the Peggin’ Pages here…just scroll down until you see them. 😉 Enjoy! 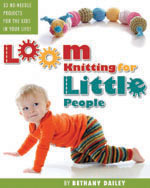 This entry was posted in Classes, Free Loom Patterns, Kids, Knitting, Loom Knitting, Looming Patterns, New Projects, Project Preview. Bookmark the permalink. The baby booties are absolutely adorable. Will you only be teaching on a chat, I’m not able to participate because my email is at work and I don’t have time at home in the evening. Will you be teaching it at the Deccor Accents yahoo group? those are sooo cute. I have a fine gauge wonderloom will this work? I also have the EFG sock loom. I really would like to try these. I love these and would definitely be interested in a class. These are sooo cute. I would love to take the class depending on when it is. My FG mini wonderloom is ready! I love these booties. I only have the EFG loom so far and the regular gauge looms. I just ordered the AJAL in the fine gauge and it will be here the last week of April. If you teach this class may I watch or use the EFG to test it out until my fine gauge comes? I would love to be counted in the class, and I do have the looms…thanks for posting and offering the class. I LOVE the booties!! Cutie Patootie Baby Booties!!! I love them. I would like to make some but I have EFG rather than FG. Maybe I could make little ones for the dollies that live around here? I would love to take the class for these when you offer it. OMG!! These are just the cutiest (in the words of Noggin TV) little things I’ve ever seen. I just might have to give those a try. Too cute! My baby’s tootsies are too big for them though ;-( makes me wish they were still that little. Great job! Hardly can wait ,till class is starting. Now I am going to make a swatch. I would love to get in on the class! I am expecting my first grandchild (grandson) in about 4 weeks! Let me know where to sign up. I have the same loom you do. I want to make the booties for my sister in law… she is due in June. Do you have the pattern.. I just found your site today… almost a year too late for the class. I am new to llom knitting just have the kniffty knitters been working on them for about a month. I think I have found my hobby. 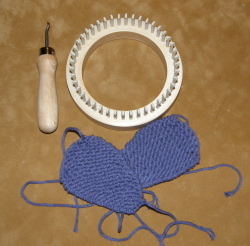 Please let me know where I can find the fine gauge loom and pattern for your booties. I so need help making these. I tried them but I really need help. will you be holding another tutorial? hello can u please post the pattern for these booties they r adorablethx . I’ve seen them they are great. If possible may i get the pattern? I would be greatful, thanks in advance. I just discovered your very cute booties and would love to have the pattern and directions on how to make them. Are you still giving classes? Please let me know. Thank you very much! May I please have a copy of your pattern for the really cute baby booties. Are they for sell? These are so cute. Do you sell these? I do not knit, but would love to send my great niece a pair. Please let me know. How would I be able to get my hands on a pair of these adorable little booties? I have been shopping around and these are the cutest! Are they available to buy? If so, I would love a pair – or two or three…..